Who is Sri Radha? The ancient Vedic texts describe Her as the Sureme Goddess, the eternal, divine counterpart of the Supreme Personality, Sri Krsna. 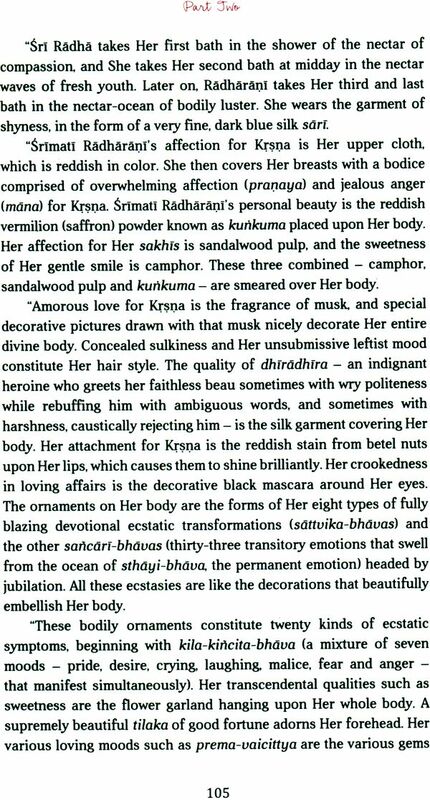 She is the embodiment of His sakti, or transcendental potency, specifically the potency of bliss. It therefore follows that those absorbed in devotion to Her, such as the authors of the articles herein, are deeply blissful. Moreover, they want us to experience that rapture. She is filled with love and kindness for all living entities, and is ever ready to bless any sincere spiritual seeker. Due to Her superlative blissful devotion to Sri Krsna, HE is willingly controlled by Her. Even though He is completely self-satisfied, He years for Her company. She is Sri Radha, our supreme shelter. Sri Srimad Bhaktivedanta Narayana Gosvami Maharaja is renowned for his beautiful eulogies to Sri Radha, in accord with his pure devotion to Her. He clearly explained that for Gaudiya Vaisnavas, service to Her lotus feet is the ultimate goal of their spiritual practice. With this message, he not only travelled throughout India but crossed the globe thirty times. For the purpose of educating and spiritually inspiring others, he would often hold public forums, in which he invited various speakers to discuss the glories of Sri Radha. His doing so inspired this book, an anthology of articles by exalted personalities conversant with Her pre-eminence. 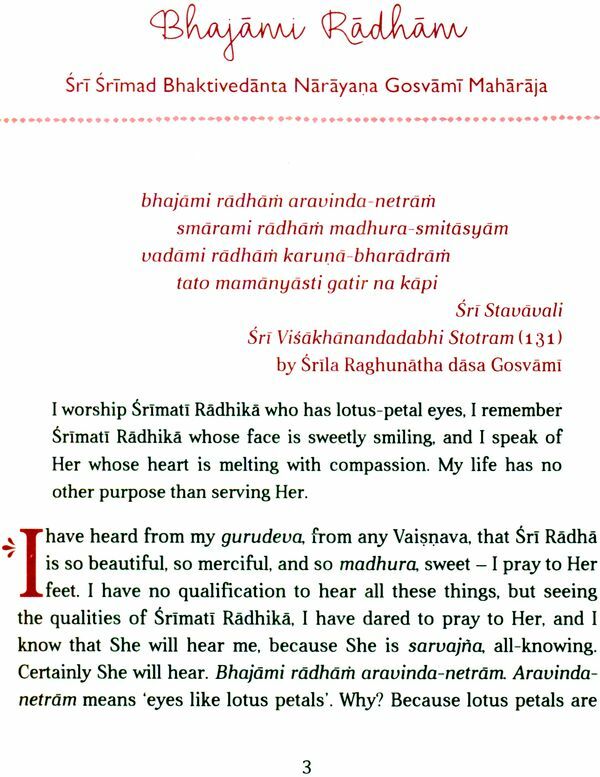 By the mercy of our most exalted Srila Gurudeva, Sri Srimad Bhaktivedanta Narayana Gosvami Maharaja, we humbly present to the English speaking readers this compilation of articles about Srimati Rasharani by pure Gaudiya Vaisnavas, entitled Sri Radha – Our Supreme Shelter. Srila Bhaktivedanta Narayana Gosvami Maharaja often held gatherings in which he invited prominent Vaisnavas, to discuss topics vital to Gaudiya Vaisnavism. In Varsana each Kartika, the topic was radha-tattva. At the time of Jhulana- yatra, the topic was Sril Rupa Gosvami. 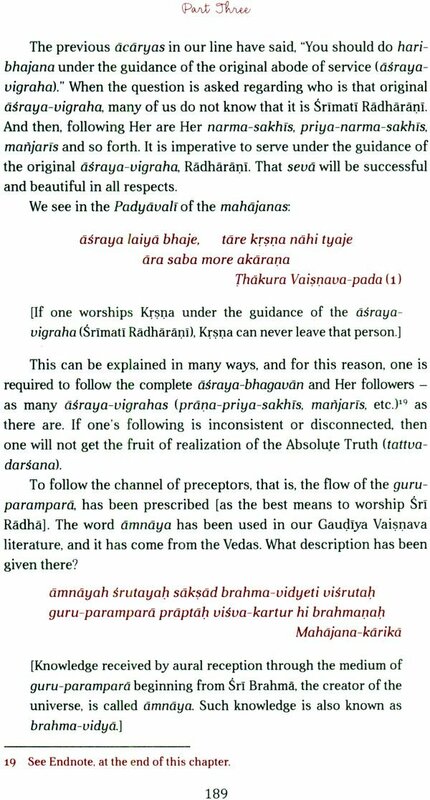 At other times, the topic was the true purport of Srimad-Bhagavatam, It is in this same spirit that we are presenting in this book, words spoken or written by various pure Vaisnavas in the line of Srila Rupa Gosvami. Since establishing service to Srimati Radhika was so integral to Srila Bhaktivedanta Narayana Gosvami Maharaja's mission, and since we have access to so many of his recorded lectures and written articles, we have chosen a selection to comprise Part One of the book, and excerpts from his commentary on Sri Raya Ramananda Samvada and his Sri Harnama Maha-mantra, to comprise Part Two. 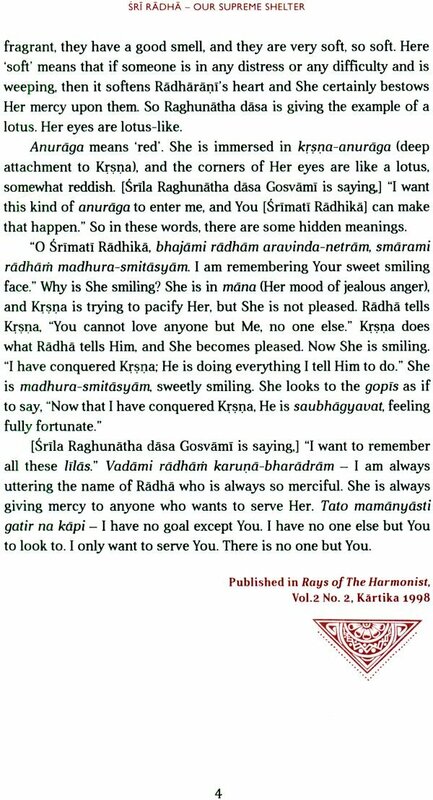 Part Three consists of thirteen articles by our guru-varga, and Part Four of kirtanas and astakams o Srimati Radharani. Srila Bhaktivedanta Narayana Gosvami Maharaja's unwavering zeal to crystallize and encapsulate the goal of Gaudiya Vaisnavism – eternal service to the lotus feet of Sri Radha performed under the shelter of Shri Rupa Gosvami – evidenced his concern that his audiences and readers should not only understand that goal but bring an increasing awareness of it into their spiritual practice, or sadhana. He stressed that it is not possible to perform sadhana if our goal is not established, and likened it to embarking on a journey without having fixed a destination. At the same time, Srila Narayana Gosvami Maharaja issued strong warnings about superficial and thus artificial expressions of enthusiasm for that goal (sahajiyaism), and unfailingly disapproved of fabricated devotion devoid of surrender. He never slightly compromised on this principle. A person's enactment of being inspired far beyond his or her actual realization is a cause of grave concern for all authentic Gaudiya Vaisnavas. False devotion never delivers the highest fruit of one's practice, which the real emissaries of Sri Caitanya Mahaprabhu are waiting to give. 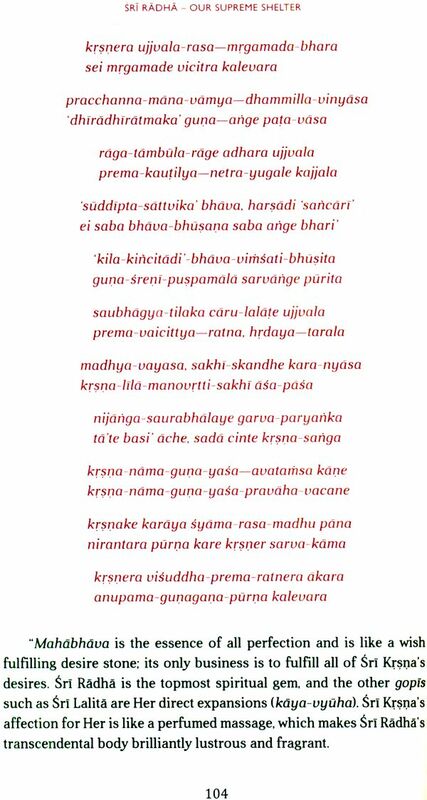 It is important to note, therefore, that as much as Srila Narayana Gosvami Maharaja spoke about the sadhya (goal), he spoke about sadhana (the authentic process to attain it), in accordance with the teachings of the foremost Gausiya Vaisnava, Srila Rupa Gosvami He thus emphasized non-duplicitous, whole hearted surrender to an authentic Vaisnava, with the unreserved, firm that in time, the Vaisnava will help one attain the goal of service of Sri Radha. Until now, we have simply occupied ourselves in the process of negation, rejecting atat (literally 'that which is not'). For eight years, our periodical, Gaudiya has extensively discussed such issues. The sahajiyas can be greatly benefited by studying these articles. 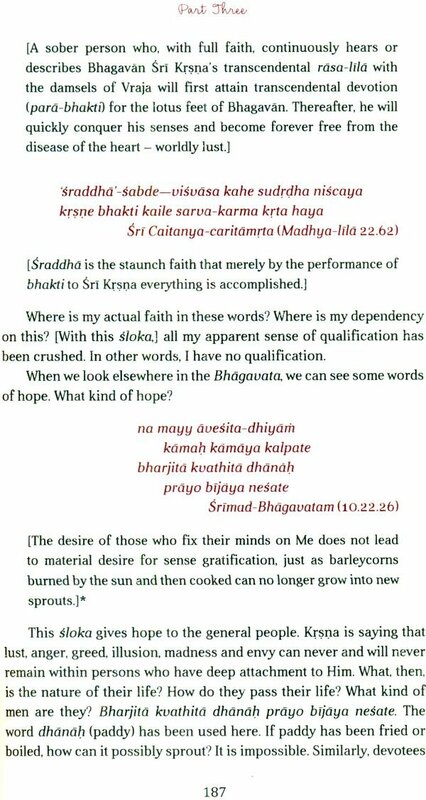 However, it is not possible to become advanced in the subject matter of hari-bhajana if we limit the scope of our endeavours either to simply negating atat or to performing favourable endeavours. 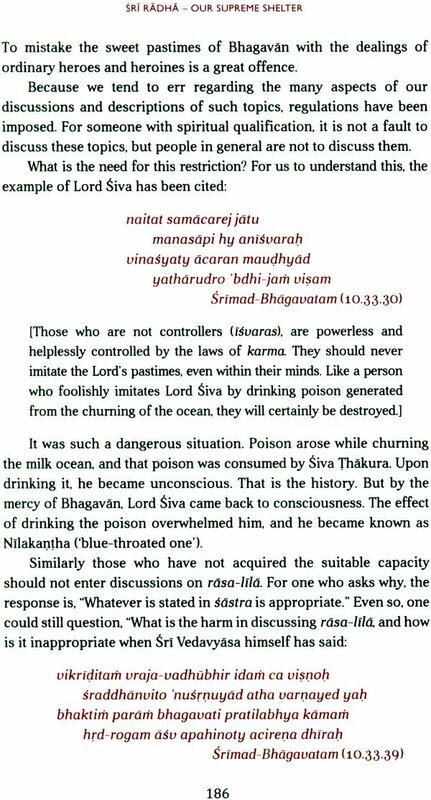 Professional orators and prakrta-sahajiyas conceal the divinely intended method of narrating the Srimad-Bhagavatam. 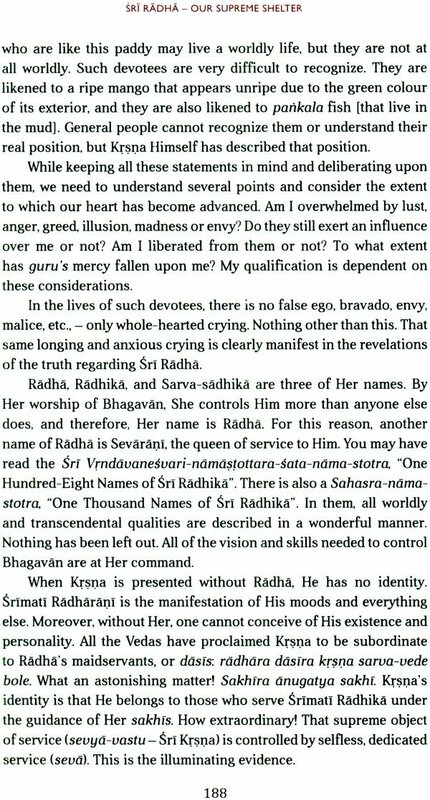 The Srimad-Bhagavatam must be expressed in virtue of Sri Caitanya-caritamrta and in line with the part of srila Rupa Gosvami. The genuine commentary of the Tenth Canto shall not be written so as to conceal this method. It was apparent to all received the mercy of Srila Narayana Gosvami Maharaja that his mission was to fulfil such desires of Srila Prabhupada. 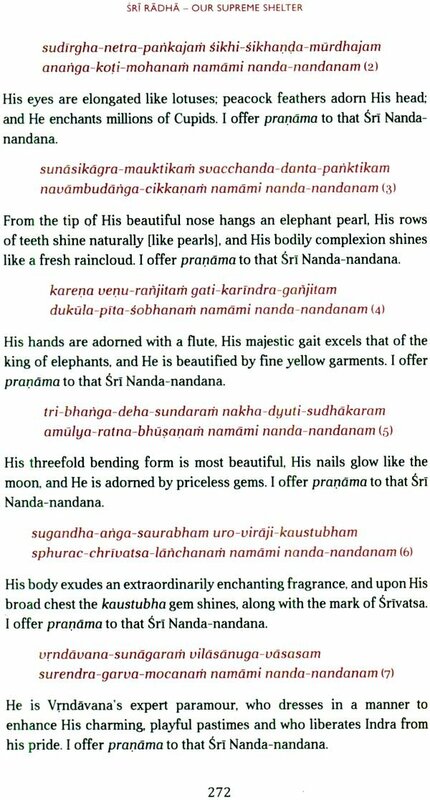 In this publication, the artices and lectures we have included by Srila Narayana Gosvami Naharaja focus specifically on the wondrous glories of Sri Radha. His writings on the methodology of sadhana and other topics can be found on the 'Books by the Author' page at the end of this book. The reader will notice that some verse translations are in square brackets and some are not. Throughout the book, square brackets denote insertions by the editors. In articles that came from lectures. Where the speaker did not translate the verse quoted, we have included the translation for the reader's information. 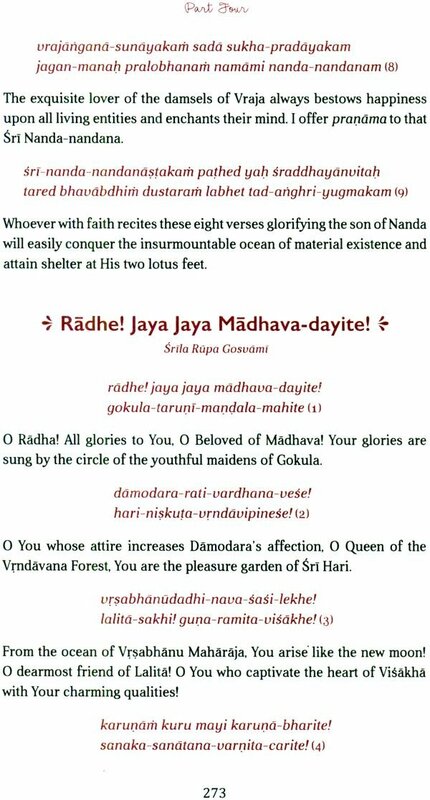 We pray that one day our hearts may swell with the affection that our beloved guru-varga have for Sri Radha. And we will feel most satisfied it this book gladdens the hart of its esteemed readers. May they kindly forgive us for any error made in its publication.